Can I Sue For The Wrongful Death Of A Loved One In A Nursing Home? Some legal rights survive our loved ones. When neglect or abuse leads to the death of a nursing home resident, surviving family members may be eligible to pursue financial compensation in a wrongful death lawsuit. When someone dies, New York recognizes that multiple parties may have legitimate cause to pursue compensation. One of these parties, the estate of the decedent, often has a claim for “pain and suffering,” damages intended to compensate the estate for the physical pain and emotional trauma inflicted on the decedent prior to their death. Likewise, surviving family members, especially those who were financially dependent on the decedent, may have their own set of claims, damages that can go to cover the costs of a burial and funeral, along with medical expenses related to the decedent’s final illness or injury. While very different, these two claims are usually joined together in what we commonly call a wrongful death lawsuit. This labeling is somewhat misleading from a legal standpoint. In legal circles, the term “wrongful death” is used only in relation to the second set of claims, damages pursued by surviving loved ones and financial dependents. Any damages pursued by the estate itself are more properly termed a “pain and suffering” claim. Notwithstanding these details, many families have every right to file suit against a negligent nursing home after the death of an elderly loved one. However, New York State law puts strict limits on who can file a wrongful death lawsuit. As set forth in the State’s Estates, Powers and Trusts Laws, Article 5, only the “personal representative” of the decedent’s estate is allowed to file the case. Personal representatives, also known as “executors,” are appointed to handle the remaining financial affairs after someone’s death. Most people will select a personal representative before death, outlining who should take care of the finances in their Last Will and Testament. When someone dies without having left a will, or having left an improperly-drafted will, one of New York State’s Surrogate’s Court will appoint a personal representative, selecting among family members according to a well-established order of priority. In any event, this personal representative holds an exclusive right to file wrongful death lawsuits. Although this court-appointed agent holds the legal right to file suit, the lawsuit itself can claim damages beyond those to which the decedent’s estate is entitled. Namely, the lawsuit can pursue damages on behalf of the decedent’s “distributees,” a group that can include a surviving spouse and children, along with parents and grandparents. When Can We File A Wrongful Death Lawsuit? New York law allows the personal representative of an estate to file a wrongful death lawsuit when the death was caused by the “wrongful act, neglect or default” of another person. In most cases, negligence will be the key concept. As medical facilities, nursing homes and assisted living facilities have a legal duty to provide adequate care, and pay adequate attention to the needs of residents. Failing to provide adequate care constitutes nursing home neglect, which can be devastating to seniors and, in some cases, lead to death. Outright abuse, either physical, sexual or emotional, can also directly cause or contribute to a resident’s death and give rise to a wrongful death lawsuit. It’s heartbreaking when an elderly loved one dies as the result of negligent or abusive behavior in a nursing home. The family entrusted the care for their loved one in the hands of professionals who were supposed to provide superior care. When that care is both inadequate and causes a death, it’s time to send a message. It’s time to talk to a wrongful death lawyer who knows elder law. We’ve already outlined the two basic types of monetary damages that are usually included in wrongful death lawsuits: pain and suffering damages and wrongful death damages. Let’s look a little closer to find out what specific losses surviving family members often claim after the death of an elderly loved one. A wrongful death lawsuit begins with so-called “pain and suffering” (or “conscious pain and suffering”) damages, financial compensation intended to reimburse the decedent’s estate for physical and emotional trauma caused by the nursing home’s wrongdoing. New York is actually rather unusual in allowing for this type of compensation. Many other states have reasoned that, once a person dies, any claim to personal damages they may have had during life die as well. New York has reasoned differently, deciding that a decedent’s claims to compensation transfer over to their estate in the event of death. Likewise, any “pain and suffering” compensation secured will be awarded to the decedent’s estate. Eventually, the compensation will be distributed to the estate’s beneficiaries, following requirements outlined in the decedent’s Last Will and Testament. Of course, the death of a loved one does not leave behind solely financial losses. You are also grieving a loss and, while many states allow survivors to secure compensation for that emotional suffering, New York does not. The State does not allow survivors to claim their own pain and suffering damages. On this count, New York is in the minority of states. Most other states allow survivors to secure damages for their own emotional grief after a death. 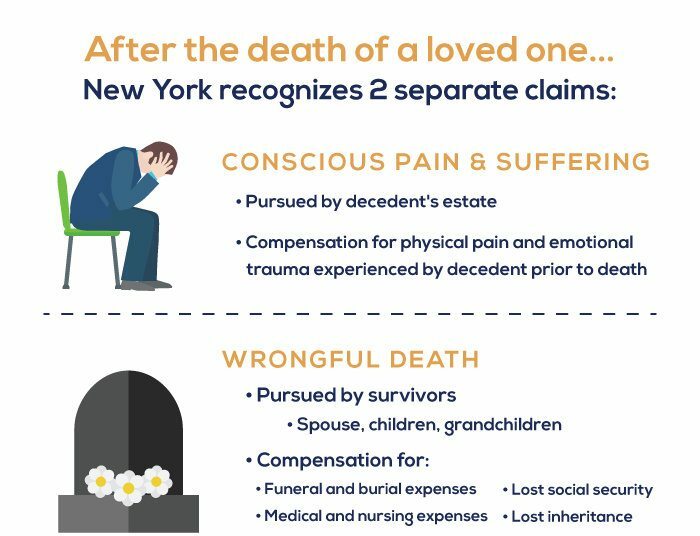 While it may not be fair, New York only provides for strictly quantifiable, or economic, losses in wrongful death claims (which, again, are very different from the “conscious pain and suffering” damages claimed by estates). This limitation can be a significant obstacle when the decedent was an elderly loved one. Some of the most common wrongful death damages, including wages lost by the decedent, are unlikely to be claimed in nursing home abuse and neglect cases. Loss of financial support is another major contributor to wrongful death damages, but nursing home residents are unlikely to be supporting others financially. New York has a set of laws, known as “statutes of limitation,” that serve as a time limit for personal injury and wrongful death lawsuits. Wrongful death lawsuits can complicate this picture, since they often involve two separate causes of action, one initiated by the estate and the other initiated by surviving family members. Where the death of a loved one is concerned, surviving family members have only two years to pursue legal action against a negligent nursing home, beginning from the date of their loved one’s death. This is true in the majority of cases, but there is a significant exception. When the decedent has only one distributee, and that person happens to be a minor, the statute of limitations can be paused, either until a guardian is appointed or the distributee reaches the age of majority, whichever comes first. Several other exceptions exist, but only one is likely to affect cases of nursing home neglect or abuse. Mistreatment in nursing homes is a serious problem. Many health experts go further, calling nursing home abuse and negligence an “epidemic.” As such, many offending nursing homes find themselves embroiled, not only in civil lawsuits, but criminal actions as well. How does this affect the case of your loved one? It may not, but if a criminal action is initiated over the same instances of misconduct that led to your loved one’s death, it could allow your family additional time to file a lawsuit. If the government chooses to pursue a criminal action against the nursing home in question, survivors have up to one year from the end of criminal proceedings to initiate their own civil wrongful death lawsuit. “Pain and suffering” damages, on the other hand, which are pursued by the decedent’s estate, are governed by a separate statute of limitations. This law allows estates up to three years to file suit, beginning on the date of the accident or negligent conduct that led to death, or up to one year from the date of the decedent’s death. On this count, New York is relatively generous. The estate will be governed by whichever statute of limitations lasts longer, whichever time limit provides the most time. No matter which statute of limitations governs your family’s claims for compensation, it should be obvious that these strict laws can become extremely complex and create numerous difficulties. Following New York’s law to the letter, however, is of the utmost importance. File a lawsuit after the relevant statute of limitations has run out and your claims will be dismissed, no matter how justified. Why Meet With A Wrongful Death Lawyer? Speaking to a wrongful death attorney with experience in nursing home abuse and neglect cases will help you understand your practical options. No one doubts that a great injustice has occurred, but New York’s wrongful death laws are complex. Gaining a full understanding of the laws that apply to your case is crucial. Nothing can bring your loved one back, and our prior successes cannot guarantee a similar outcome in your case. Pursuing justice, however, is something our lawyers believe in firmly. In nursing homes and assisted living facilities across the nation, elder abuse is spreading. We believe that every senior deserves excellent care, thorough attention and, fundamentally, the dignity to which all people are entitled. The only way to stop the terrible trend of elder mistreatment is to stand up and take action. We believe every family should be given the right to learn more about their legal options and, if warranted, pursue justice. That’s why our elder abuse and neglect lawyers only work on a contingency-fee basis. Our clients never pay us anything until we secure compensation for them. The attorneys at Banville Law are determined to put an end to nursing home abuse and neglect in the state of New York. No one deserves to suffer at the hands of a negligent elder care facility. Contact us today for a free consultation. Together, we can make a difference for elderly people everywhere. Call us now.